Ichiba Toyota / Scion 25mm Bolt-On Wheel Spacers Version II for Scion iQ tC tC2 xA xB xD xB2. Wanting to push the wheels out farther without sacrificing handling & stability? 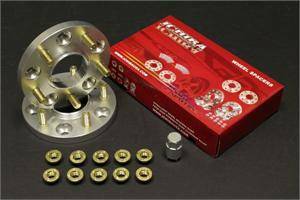 Ichiba 25mm Version II Wheel Spacers are exactly what you need for your Scion! Note: Sold as one pair (2pcs) with 8 or 10pcs nuts with one special socket.